Are You a Candidate for Implant Retained Dentures in Fort Worth? If you are among 3% of the adult population who have no remaining natural teeth, you have probably tried traditional dentures to replace your teeth. While dentures are commonly used because they are affordable and convenient, they do not come without certain disadvantages, such as gum irritation. To solve the discomforts of dentures, you have probably considered dental implants. However, due to decreased bone density, you may not have been a candidate. Now, you can get implant retained dentures in Fort Worth, even with a history of bone loss. Implant retained dentures are a cost-effective way to invest in your oral health and quality of life. 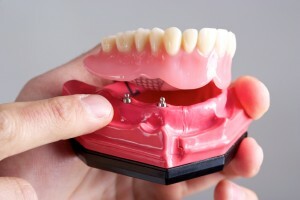 Unlike traditional dentures, no messy adhesives are used to hold the prosthetic arches in place. Instead, four dental implant posts anchor the arch to the jawbone. This provides an increase in function and appearance when compared to removable dentures. With the dentures held securely in place, you will never have to worry about slipping or discomfort, like that of traditional dentures. You will gain an improved ability to eat and speak with confidence as they closely mimic the appearance of function of natural teeth. In fact, your biting force will be 70% better than that of dentures. Since the dentures use dental implants, the underlying bone remains stimulated. This helps to preserve bone loss to protect your facial structures from wrinkles and sagging. You can even restore lost lip-support that may have already developed. If you have considered dental implants in the past, but were told you are not a candidate due to bone loss, you may still benefit from implant retained dentures. The type of implant posts used for the dentures are smaller than those used for traditional single tooth implants. As a result, they can often be used for those who have bone loss. However, a CT scan will still need to be taken to ensure the correct placement of the posts. In addition to bone density, you must also have healthy gums. Your medical and lifestyle history will also be evaluated to ensure there are no risk factors for implant failure. With infection the biggest threat to implant failure, you cannot have any medical conditions or take certain medications that limit the body’s ability to heal and fight infections. Those who use tobacco or drink alcohol excessively may not be candidates as the substances make you more prone to infections. If you are interested in replacing your missing teeth with implant retained dentures, you will need to schedule a consultation with your dentist in Fort Worth. West 7th Smiles offers the consultation necessary to determine if the tooth replacement option if right for you. If you are a candidate, a comprehensive treatment plan will be created to begin restoring your smile. If you are ready to permanently replace your missing teeth with a lifelong solution, contact West 7th Smiles today. Dr. Boyd will discuss your options to regain a complete smile. Comments Off on Are You a Candidate for Implant Retained Dentures in Fort Worth?